What is a miners cut diamond? A miners cut is a type of diamond cut common in antique jewelry dating back to the 1830s. Many Georgian, Victorian and Edwardian style engagement rings feature this type of cut because it was a popular 19th century jewelry design. The original old mine cut diamonds have a rich history that reflects the history of the diamond jewelry trade. What Is a Miners Cut Diamond? The miner cut diamond is shaped into a high crown with a small table, a round to somewhat rectangular girdle, a deep pavilion and a large faceted culet. The cut was the earliest form of the brilliant cut, which means that the diamond was cut to allow the stone to sparkle under even the dimmest candlelight of the era. The miner cut resembles both the modern cushion cut. In fact, some jewelry experts consider the cushion cut the modern version of the miner cut. However, the miner cut diamonds are slightly more rounded and do not have such an obvious rectangular or cushion shape. The proper name of the miner cut is old mine cut. The original old mine cut diamonds of the 19th century were referred to by this name because the jewels came from the old diamond mines in India rather than South Africa, which dominates the diamond industry today. In the 19th century, artisans shaped each miners cut diamond by hand. All diamonds remained hand-cut until the early 1900's. Due to the handcraftsmanship, each diamond was unique and no two cuts were identical, unlike today's diamonds which undergo machine-assisted cutting processes. Anyone seeking an original handcrafted old mine cut antique ring should inquire if the stone has been recut. Some restored antique rings have been recut with modern cutting techniques. The old European cut was also popular in the 19th century and resembles the old mine cut. The two cuts share a similar shape in terms of high crowns, small tables, deep pavilions and large culets. However, the old European cut diamond has a heavier crown, smaller table than the miner cut. The modern brilliant cut is based on the old European cut. An old European cut diamond has a circular girdle like modern round brilliant cut diamonds. Once you know what is a miners cut diamond, you should be able to recognize it on sight when ring shopping. Antique dealers and estate sales are the best way to find original old mine cut diamond rings. Since the original handcrafted miner cut rings are no longer manufactured, you have to purchase an antique ring or loose stone to get a true miner cut diamond. However, there are some modern antique inspired rings with cuts that resemble the miner cut look. 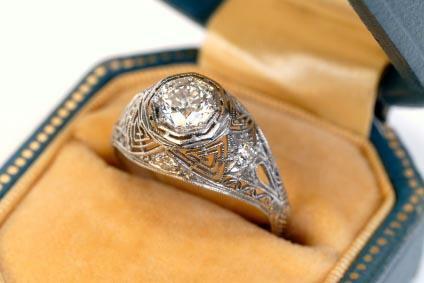 Antique style diamond ring may be available at local jewelers that feature a larger selection of ring types. Fay Cullen: Fay Cullen generally has a number of antique old mine cut diamond rings for sale. Lang Antiques: Lang Estate and Antique Jewelry also often has antique miner cut rings for sale. Ruby Lane: Ruby Lane often offers an old mine cut antique diamond ring for sale. If you are searching for an antique style diamond ring, a miner cut diamond is worth considering. An antique old mine cut diamond may have special meaning to a couple that wants a one-of-a-kind ring with a fascinating history. You will certainly enjoy the beautiful unique way that that miner cut diamonds sparkle in the light.